Yes, you can freeze delicious summer tomatoes and use them for sauce the following April! I had cored, blanched and frozen (but not peeled) about 1.5 lbs of San Marzano tomatoes (click for more specific how-tos of what I call “Lazy Preserves”) from Restoration Farm last summer when I just couldn’t figure out what to do with all that lycopene bounty and was — gasp! — almost sick and tired of summer tomatoes. They were in the back of my freezer in a freezer bag (suffering a bit of freezer burn, I must admit) and I decided that now was the time to see how they had fared. The other day I knocked off some — but not all — the ice crystals that had formed and put them in a soup pot and simmered them down to about a pint that was more paste than liquid, removing the peels as they separated from the flesh. Today I took that pint to a friend’s house and we used it for the base of a bruschetta/pizza toast dish that pleased adults and kids alike. It was dense and sweet with a balance of acidity — in short, everything you want from tomato sauce — and since it was organic and local — there was nothing you don’t want in it (even the freezer burn didn’t matter). Warm the oil in a saucepan. Add the smashed garlic and cook at medium low turning cloves until they are uniformly golden brown. 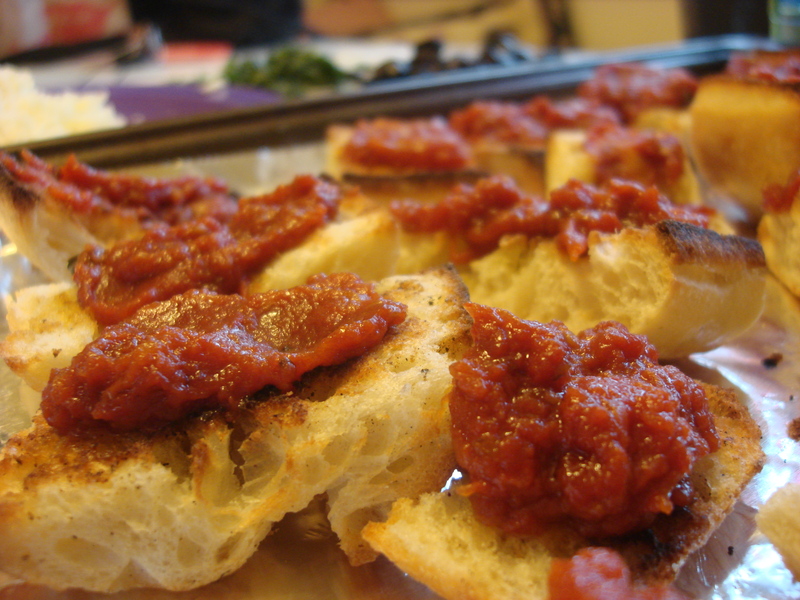 Remove cloves and discard (or rub the insides on toast for bruschetta), Add tomato paste or puree and basil leaves. Bring to a simmer and add the tablespoon of wine and salt to taste. Simmer until the sauce reaches desired thickness (at least 15 minutes to incorporate flavors). Serve over pasta, or on toasted bread. Top with olives, grated mozzarella or parmigiano reggiano, minced fresh basil, or other pizza-loving ingredients. What a great idea! Not a true tomato fan myself, I tend to get a bit tired of tomatoes when I receive them in my CSA box week after week. So it is nice to know I can keep them for a later use. ohhhhh. This looks very yummy…..Bright, fresh, sweet tomatoes….. Thanks for stopping by! And for the kind words…still owe you a prize post…March and April have been sooooo, sooo overwhelming! Isn’t it nice to have the wonderful taste of summer this time of the year. I do what Mad Dog does…just cook them down some. I then store the tomatoes in pint and quart square containers in my freezer. It doesn’t take up so much space. Of course, if I did grow so many tomato plants I would have more space in my freezer as well. LOL. I also did cooked down tomatoes, but sometime in September, I was overwhelmed by the start of the semester and the nonstop flood of tomatoes and went the freeze-now, cook later route. So glad it worked! I can definitely understand. All of the sudden all of the tomatoes that we have been waiting to ripen…all ripen at the same time. Last year our kitchen counters were almost totally covered with tomatoes all at once. I’m inspired to rummage through my freezer – and see what I can come up with before the new round of fresh produce starts! I have one more batch of yellow Best Boys…not sure yet what I’ll do….any suggestions? Great seeing you Saturday! As I said to Karen, I also did cooked-down tomatoes, but sometime in September, I was overwhelmed by the start of the semester and the nonstop flood of tomatoes and went the freeze-now, cook later route. So glad it worked! Will have to try the chili…love a bit of burn. That looks great – you must have been so pleased that it worked so well. I really was…it was such a welcome taste of summer – and inspiration to get my garden together for this season! It is such fun to pull something like this from the freezer!